AdminFaces is an open source project which integrates Primefaces, Bootstrap and Admin LTE in order to create fully responsive and mobile ready JSF applications. Admin Theme: Is a Primefaces theme based on Bootstrap and Admin LTE where Primefaces components are customized to look like mentioned frameworks. 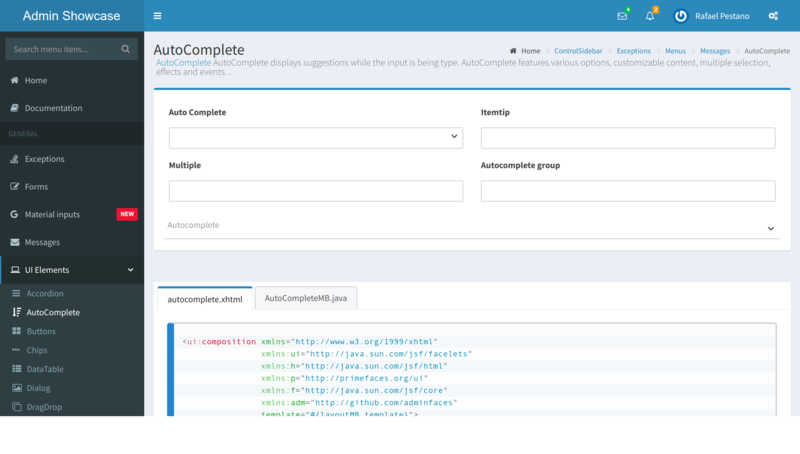 Admin Template: It's a fully responsive Java Server Faces admin template which is also based on Bootstrap and Admin LTE. 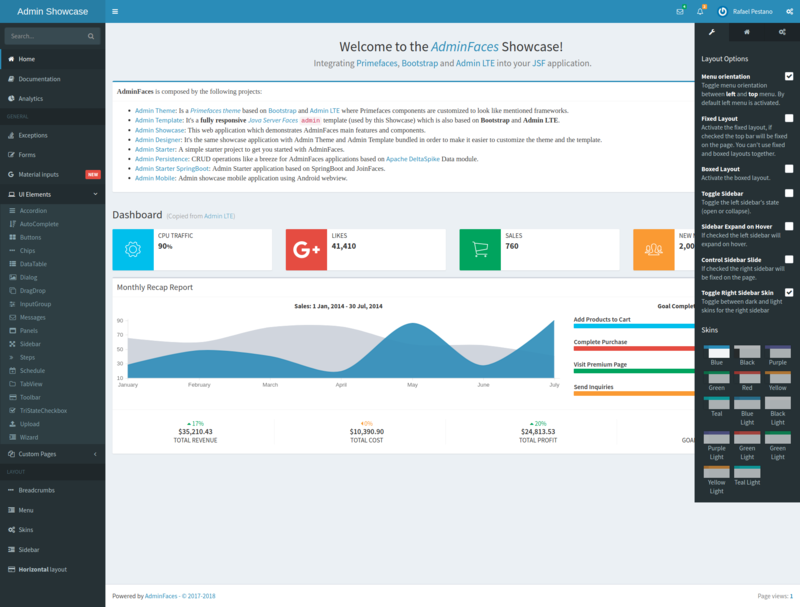 Admin Showcase: A web application using admin-theme and template showing AdminFaces main features and components. Admin Designer: A showcase application used to customize Admin Theme and Template. This application is used to evolve AdminFaces as well. Admin Starter: A simple starter project to get you started with AdminFaces. Admin Persistence: CRUD operations like a breeze for AdminFaces applications based on Apache DeltaSpike Data module. Admin Starter SpringBoot: Admin Starter application based on SpringBoot and JoinFaces. Admin Mobile: Admin showcase mobile application using Android webview. Admin Docs: a project that holds AdminFaces documentation. 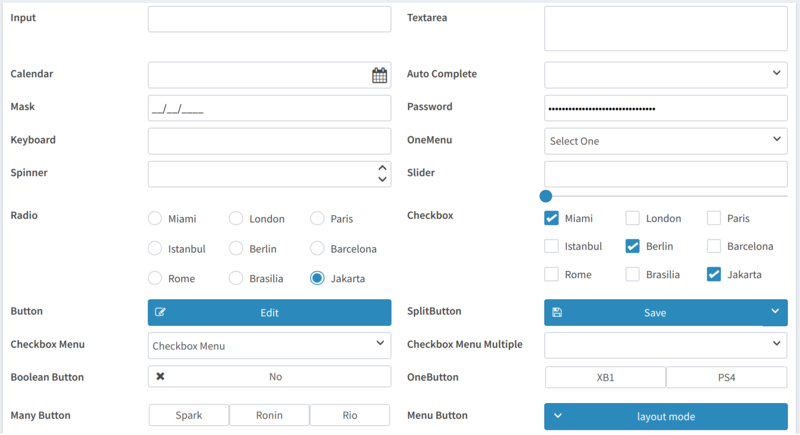 Admin Theme is an open source premium PrimeFaces theme where components are styled to look like AdminLTE and Bootstrap. See screenshots	to get an idea. For usage details see Admin Theme documentation . Admin Template is a fully responsive Java Server Faces admin template based on Bootstrap and Admin LTE. See screenshots for a better idea. For usage details see Admin Template documentation . 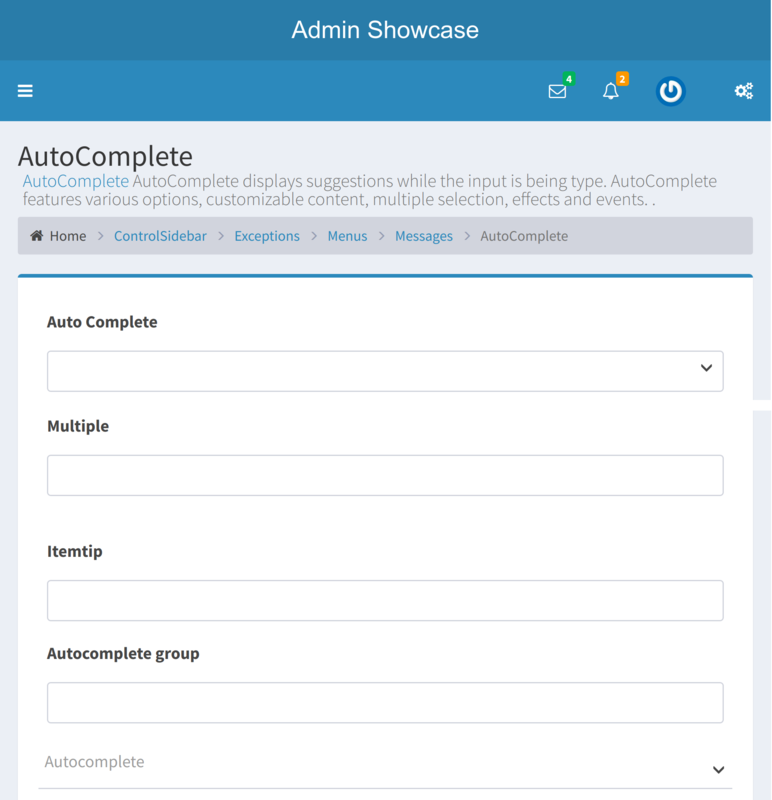 Admin Showcase is a showcase web application, deployed on openshift, which demonstrates AdminFaces main features and components. Note that the Showcase uses Admin Template and Theme. Admin Starter: The default starter is a simple JavaEE 6(+) application without any persistence layer. You can run it on a JavaEE 6 or newer server, via wildfly-swarm and also via Docker. Admin Starter Persistence: Admin Starter sample project with persistence layer based on Apache DeltaSpike module via Admin Persistence. Admin Starter Tomcat: Admin Starter application for Tomcat. Admin Starter SpringBoot: Admin Starter application using SpringBoot and JoinFaces. Admin Starter Shiro: Admin Starter application using Apache Shiro for security. Admin Starter Security: Admin Starter application using JavaEE 8 security API for authentication and authorization. Admin Starter SpringBoot Security: Admin Starter application using SpringBoot, JoinFaces and Spring Security. For running instructions access each starter github README. We have maven archetypes for some starter projects, see available starters here. Current version (under development) of documentation can be found here.